Being powder skiers, we’re always looking to get to something first. That often requires some early starts or races up skin tracks. Sometimes it calls for something a little dirtier. Sometimes you just need to go somewhere you’re not supposed to. Many of us have hid behind the big boulder at the entrance of Whistler’s Don’t Miss so we could drop in after patrol sweep. Some of us have tripped the emergency stop at the unload of a chair so the group behind you wouldn’t beat you to your line. I’ve done some dumb things to get first tracks down somethings, like digging a snow cave at the top of Blackcomb on the evening of a big storm so I could ski a vertical mile of pow before patrol opens up the mountain. I’ve also posed as a digger for the summer terrain park early chair loading. And I used to ski with a race bib in my pocket so I could throw it on and take the ski school line. But nothing I’ve done has, or ever will compare to the poach of the 2018 Olympic Halfpipe. Maybe the most expensive snow structure ever created, the Pyeongchang Superpipe is the crown jewel, with 22ft walls and a length of 500 ft. Only the best athletes in the world will get an opportunity to slide down it. Or so was the plan. One skier pulled of the world’s most strategic poach of the pipe. I guess by the looks of her ski style, it was a more of a hack. Elizabeth Swaney, though from the States, didn’t have the chops to ski for the US freestyle team, so she instead used her Grandfather’s Hungarian citizenship to ski for their (non-existent) team. She competed in World Cup events that took place in remote places at the same time as big events, like the X Games, so she could place better pick up enough tour points to qualify. And it worked. Swaney pimped the system and got to do her celebration run on the best pipe in the world. 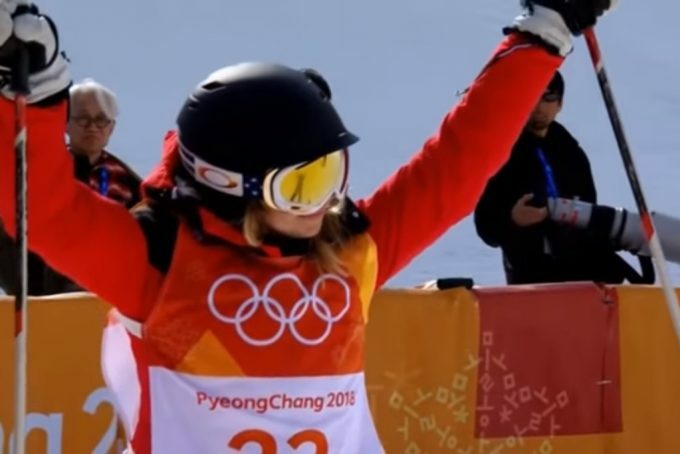 The media has called her out for being so mediocre – she did essentially no tricks on her Olympic runs and barely got above the lip of the pipe. They say it put a black mark on the Olympics. And that’s why what she did is so cool. In skiing, the biggest thrill you can get is being in a situation you’re not supposed to be in. And it’s a great middle finger to the Olympic establishment who I feel is just using park and pipe skiing and snowboarding to attract more young viewers. Elizabeth stuck it to them – and it must’ve felt so good. Next time you’re busted skiing something you’re not supposed to, sneaking to the front of an extra long lineup or riding a chair without a pass, just tell them you’re skiing like an Olympian. As someone with an amputated big toe and an Irish mother, expect to see me in the 2022 Paralympics skiing pipe for Ireland. It’s what Swaney would have wanted.